Has a haggis ever run wild and free? If you believe a haggis is an iconic Scottish dish of sheep’s stomach stuffed with spiced innards and oatmeal, then no. But one humorous theory posits that the haggis’s source is not the sheep, but rather, the wild haggis: a creature with four legs and a shaggy mane. Physical depictions of the wild haggis vary, but one museum has a “specimen.” In a taxidermy display at the Kelvingrove Art Gallery and Museum in Glasgow, there is a lone wild haggis. Shaggy and short-legged, it is displayed beside a prepared haggis for comparison, and a plaque declares that this is the Haggis scoticus. To hunt the fierce haggis, man’s awfu’est foe. And weel may my bairn ha’ a tear in his ee. For I shallna come back if the haggis hunts me. Montague’s words seem to have stuck. In the British Isles in 2003, the press had a field day when a haggis company surveyed 1,000 American visitors to Scotland and found that a third believed in the wild haggis. In 2014, the Visit Scotland website posted a joking “reveal” of blurry footage, showing a swiftly scurrying, hedgehog-like haggis. Those interested in owning their own wild haggis can purchase stuffed animals of the creature or haggis-summoning whistles. 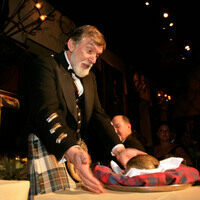 Soon, though, on January 25, haggis-lovers will enjoy the dish at Burns Night celebrations around the world. In honor of the Scottish poet Robert Burns, his admirers display a haggis to the tune of bagpipes and recite the famed poem Address to a Haggis. In the poem, Burns remarks on the haggis’s cheerful visage (“Fair fa’ your honest, sonsie face”). But he makes no mention of the wild beastie of the Highlands. 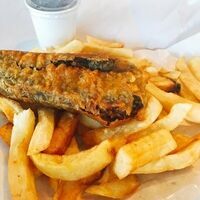 Scotland's beloved traditional dish is deep-fried and served up fast-food style. 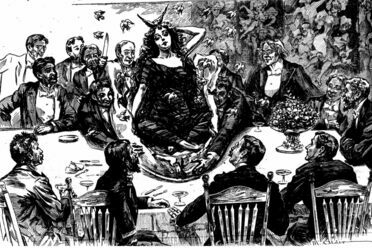 The Vegetable Lamb of Tartary puzzled scientists and philosophers. The world's spiciest ice cream comes from Glasgow.